Gun one, occupied by a gun line team from 2nd platoon, Alpha Battery, 2nd Battalion, 32nd Field Artillery, 4th Infantry Brigade Combat Team, 1st Infantry Division, fires a 155mm M777 Lightweight Howitzer during a live fire exercise at training range 52 on Fort Riley, Kan., on January 23, 2012. 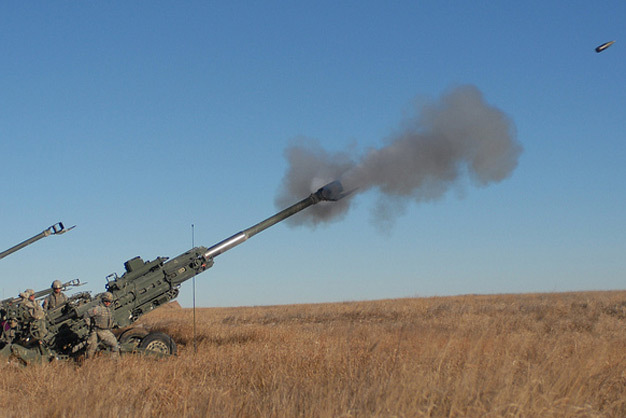 The 2-32 FA is the first battalion in the 1st Infantry Division to fire the M777 on Fort Riley. US Army photo by Sgt. Gene A. Arnold, 4IBCT PAO.